The Cleveland Cavaliers have lapped the field in the race for homecourt advantage throughout the 2010 NBA Playoffs; the Cavs have just nine games remainingâ€”six of which will be played at homeâ€”and currently are ahead of the L.A. Lakers by three games in the loss column. The Cavs lead the Orlando Magic by six games in the loss column. I thought that playing “small ball” for a month without Shaquille O’Neal and Zydrunas Ilgauskas might cost the Cavs some wins but the Cavs went 11-1 from February 25 to March 21 to all but clinch having the leagueâ€™s best record for the second year in a row; the Lakers went 9-3 during that time, while the Magic went 11-2. It says a lot about the Cavsâ€™ depth that despite being without their top two centers for a month they actually pulled further away from both the Lakers and the Magic. Some commentators have suggested that the Cavs are actually better off without Oâ€™Neal and/or Ilgauskas. That is ridiculous. The â€œsmall ballâ€ lineup can be very effective versus certain teams throughout a game and it can be a nice change of pace for limited periods of time even versus big teams but it is not a recipe to win 16 playoff games and claim the Larry Oâ€™Brien Trophy. The only way that the Cavs will consider this season to be a success if is they win the championship and in order to do that they will likely have to defeat both the Magic and the Lakers in the playoffs; â€œsmall ballâ€ will not get the job done against either of those teams. Now that the Cavs have re-signed Ilgauskas they have the top six players from their 2009 team that posted the best record in the NBA and won eight straight playoff games en route to a berth in the Eastern Conference Finals; in the 10 man rotation, this yearâ€™s Cavs replaced (listed in order of mpg) Ben Wallace, Wally Szczcerbiak, Joe Smith and Sasha Pavlovic with Antawn Jamison, Anthony Parker,Â Shaquille Oâ€™Neal (who is on schedule to return during the playoffs) and J.J. Hickson (who was on the roster last season but not a major member of the rotation). The Cavs are so deep now that Jamario Moonâ€”a two year starter for playoff teams in Torontoâ€”currently ranks 11th on the team in mpg, while Leon Poweâ€”a major rotation player for the 2008 NBA Champion Boston Celticsâ€”is a nice frontcourt insurance policy who ranks 13th on the team in mpg. 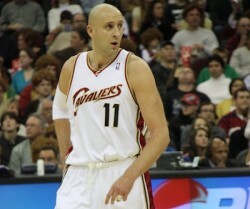 Ilgauskas came off of the bench in his first two games since rejoining the Cavs. He has started just six times in 55 games this season. His numbers in those two gamesâ€”and for this season in generalâ€”are underwhelming but statistics rarely tell the complete story about anything that is as dynamic and fluid as an NBA basketball game. Ilgauskas opens up the court offensively because when he spots up the opposing center has to come out of the paint. Also, when Ilgauskas plays down low his length enables him to be a very effective offensive rebounder; although his offensive rebounds per game average dropped from 2.4 last season to 1.7 this season that is largely a function of reduced playing time: on a per minute basis his numbers in that category have remained steady (3.2 in 2008-09, 3.0 in 2009-10). Ilgauskasâ€™ lack of mobility defensively is well noted but anyone who has played basketball at any level should be able to understand that as a 7-3 presence in the paint Ilgauskas has a certain impact just by properly positioning himself. Coach Mike Brown likes pairing Ilgauskas with Anderson Varejao on the second unit because Ilgauskasâ€™ outside shooting touch provides a nice counterpoint to Varejaoâ€™s mobility. Keep in mind that those two players started for Clevelandâ€™s 66 win team last season, so Clevelandâ€™s bench has more talent and experience than the starting units deployed by many NBA teams. J.J. Hickson plays with good energy as a starter and Coach Brown can always juggle those playersâ€™ minutes during a given game based on matchups, foul trouble and so forth; as the clichÃ© states, it is more important who finishes than who starts, a point that has been exemplified by Manu Ginobili and Lamar Odom on recent championship teams. Several of the Cavsâ€™ losses this season came in clusters right after personnel changes: the Cavs started 3-3 as Brown dealt with the Delonte West situation and adjusted to having a new rotation after the offseason acquisitions of Oâ€™Neal, Parker and Moon. Then the Cavs won 40 of their next 48 games before dropping three straight right after acquiring Jamison in exchange for Ilgauskas. The Cavs bounced back to capture 12 of their next 13 games before going 1-1 since Ilgauskas returned. It likely will not take the Cavs very long to regain their stride once again, though it will be interesting to see what lineups Coach Brown uses down the stretch: he certainly wants the Cavs to clinch homecourt advantage and develop some rotation continuity heading into the playoffs but once homecourt advantage is clinched he probably will reduce the minutes of LeBron James and some other key players. However, Coach Brownâ€™s final major personnel adjustment of this season will be his most important and could possibly take place in the pressure packed environment of the Eastern Conference Finals: the Cavs simply cannot afford to lose a game or two while getting used to having Oâ€™Neal back on the court, so when the “Big Bill Cartwright” returns both he and his teammates will have to be very focused on performing within their designated roles, walking that fine line between not trying to do too much but also not deferring too much to others. The nature of that kind of challenge should not be underestimatedâ€”just look at what happened to the Magic during last yearâ€™s NBA Finals when they tried to bring back All-Star point guard Jameer Nelsonâ€”but the Cavs really seem to be on a mission this season: they have not only consistently pounded the weaker teams but they have gone 6-2 versus top Eastern contenders Orlando, Boston and Atlanta plus 2-0 versus the Lakers.